One of the top movie releases of October was Breathe, the story of a fit, healthy young man who was struck down with poliomyelitis - polio as it is more commonly known - and only kept alive by using an iron lung to breathe. Fortunately, our young people no longer have to worry about being crippled or killed by this dreadful disease. Polio was wiped out in the UK by 1982, after the compulsory introduction of oral vaccination. Polio still exists today, although the number of people infected across the world has decreased by over 99% since 1988, falling from more than 350,000 to 37 reported cases in 2016. The disease has now been eradicated from all but three countries: Pakistan, Afghanistan and Nigeria. The global campaign to wipe out polio has been taking place for many years, with Rotary International playing a leading part. Through their PolioPlus campaign, Rotary clubs worldwide have raised more than one billion pounds towards the cost of the health improvements and polio vaccination for all, supported by Microsoft entrepreneur Bill Gates. In recent years Rotary contributions have been matched 2 to 1 by the Gates Foundation. Although polio still exists today, the number of people infected has decreased by over 99% since 1988, with only 37 cases reported in 2016. 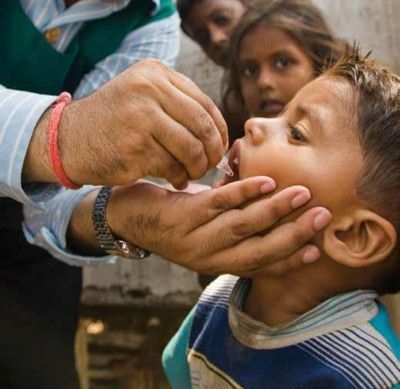 Cranleigh Rotary Club continues to play its part in this ongoing global endeavour, having donated many thousands of pounds towards polio eradication. 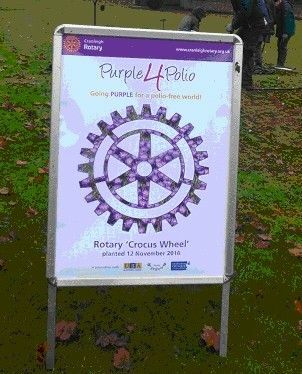 A year ago the Club planted 6,000 purple crocus bulbs on The Common in Cranleigh to help publicise the PolioPlus programme (see purple4_polio_crocus_planting.phtml). These should reappear next spring to reinforce the message - everyone on the planet may soon be freed of this crippling, deadly disease if we persevere with the eradication effort. We are nearly there!